Te Puea was born at Whatiwhatihoe, near Pirongia in the Waikato, daughter of Te Tahuna Herangi and Tiahuia, daughter of the second Māori King, Tawhiao Te Wherowhero. As the eventual successor to her grandfather, she was educated in the traditional Māori ways. At age 12 she began attending Mercer Primary School and then went on to attend Mangere Bridge School and Melmerly College in Parnell. As a young adult she was wild and promiscuous – a lifestyle she later came to regret. In 1911 she returned to her people and took up her hereditary role. Her first task, the one that re-established her mana among her people, was to successfully campaign on behalf of Maui Pomare in his election bid to become the Kingite Member of Parliament. Te Puea later fell out with Pomare because he supported Maori soldiers fighting for New Zealand overseas. Te Puea worked against this behind Pomare’s back. He became aware of her attitude and in the winter of 1918 attended an anti conscription hui called by Te Puea where he was roundly abused by all the elders of the kingitanga. She also began farming at Mangatawhiri. 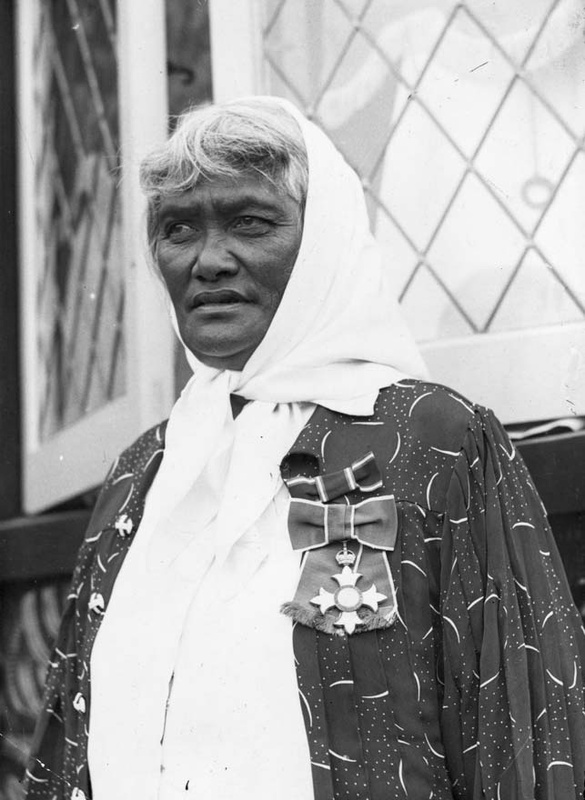 Te Puea was firmly opposed to conscription when it was introduced in 1917 and provided a refuge at her farm for those who refused to be conscripted into the New Zealand Army. Because of Waikato’s anti government stance on conscription during WW1 and Te Puea’s personal involvement in hiding conscripts. She was not a popular figure with government or local pākehā after WW1. Because of the German background of her father’s family Te Puea was often accused of being a traitor. After WW1, farmers were reluctant to offer Kingites’ work and during the Royal visit of the Prince of Wales the kingites desire to host the prince was snubbed in favour of an Arawa visit which was open to all Maori to attend. Arawa were an iwi that had remained loyal to the government, taking an active part against the kingites in the land wars and playing a full role in WW1. Te Puea was raised by people who had fought to resist the government invasion of the Waikato in 1863 and by people who had lived through the bitter years that followed. She had little reason to love or trust the Pākehā. However as time went by she came to see the need for reconciliation. In 1946 Te Puea approached the government to say the tribe would be willing to accept money to compensate for the loss of lands after the defeat of the Kingitanga in 1863. After nearly 20 years of negotiation she accepted, on behalf of Tainui, a settlement offered by the Prime Minister, Peter Fraser, of an initial grant of 10,000 pounds and 5,000 pounds (later $15,000) a year spread over 40 years. No provision was made for inflation which at that time was very low. By the time the deal was presented to the tribe the next day the money had been increased again to 6,000 pounds for 50 years and thereafter 5,000 pounds in perpetuity. She recognised this as an acceptable offer. However the payment acknowledged that a grievous wrong had been done to her people. – King, Michael (1977). Te Puea: a Biography. Auckland: Hodder and Stoughton.